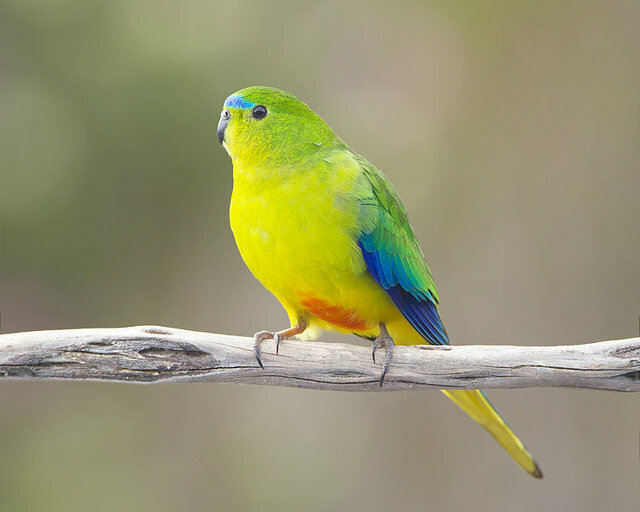 Orange-bellied parrots, native to southern Australia, are one of most critically endangered species on the planet. Wildlife experts say that this year, just 17 of the birds were counted in their native nesting grounds on the island of Tasmania -- down from 50 individuals last year. But thanks to some careful planning on the part of conservationists, that number has just been more than doubled. In light of the species' seemingly inevitable extinction, Australia's Department of Environment launched a captive breeding program to assure their continued existence -- and so far nearly 300 of the rare birds have been hatched. After learning that wild orange-bellied parrots had dipped to less than 10 breeding pairs, attributed to food shortages resulting from recent droughts, officials decided that it was time to help out. "There wasn't the minimum number that we would have liked to have seen down here," says breeding center spokeswoman Jocelyn Hockey. "For the last two years we had decided that a minimum of 20 birds, so 10 breeding pairs, was what we wanted to see down here and unfortunately this year, it didn't quite make it." Today, 24 captive parrots were released to bolster their dwindling counterparts, but their success isn't a certainty. Although the released birds were selected based on their genetic variety and fitness, conservationists say that their success outside of captivity will depend in large part on acquiring skills from the few birds remaining in the wild -- a lineage of knowledge now possessed by just over a dozen parrots. "The wild birds know the area, know how to behave as wild birds and can teach the captive birds how to forage, how to avoid predators and then make the migration back to the mainland," says keeper Jocelyn Hockley. It will take a year before it is known whether the captive birds have integrated well enough to produce offspring -- though time is short. Unless current trends are curbed, orange-bellied parrots are predicted to be extinct in the wild within four years.